We recently found out we are having our third son, Caleb Drew. His namesake is in honor of my father, Drew Hastay. We planned for this baby, we prayed for him and we prepared for a year and a half. I did genetic testing, IV vitamin therapy, saw naturopaths, spent thousands in the best supplements, ate organic, skipped necessary x-rays, didn’t use lotion or shampoo with parabens, you get the idea. Every month we were ready to try for him, I put it off just one more month because I wanted to make sure I was doing everything perfectly. Finally, April 26, 2016, we found out we were pregnant. Everyone said the same thing. “I know in my heart this baby is healthy.” And the truth is, I did too. I was not worried about another Spina Bifida diagnosis because it is so incredibly rare to have one child with it, let alone two. Plus we had other things to worry about. Our insurance dropped all of Miles’s access to medical care, providers and hospitals, therefore I was fighting hard to keep him safe. I was also stricken with awful morning sickness and fatigue, being hospitalized twice in my first trimester. I kept telling myself that once I knew Caleb was healthy then everything would be smooth sailing. At 15 weeks I got the Quad blood test that looks for something called AFP. It’s a protein that spills into the blood stream that indicates a neural tube defect. This test came back positive with Miles at a level 4 (normal is below 2) and was our first indication of Miles’s birth defect. For Caleb, I sat on the couch clenching my phone, waiting for the nurse to call me back with results. Since I had not heard from her first, that must be good news. I finally got her call. Bryce was working on the plumbing under the sink and I sat close to him. The nurse’s voice began to shake. I knew. She talked about my elevated AFP and that my baby may have a neural tube defect; that I should see a high risk doctor. “I’m so so sorry,” she kept repeating. “Ohhhhhhhh My Gosh, that’s too high,” were the only words I could slowly muster. Bryce sat by the sink with his head down. He knew what we were talking about. I got off the phone, we hugged and I cried. My perinatologist immediately called me. She is the same doctor that gave me Miles’s diagnosis. She was beside herself. She said our only hope is that the lab got the results wrong. Banking on a lab error doesn’t leave your hopes high. We had to wait 4 days before getting an ultrasound, though we already knew what was happening. I researched how an AFP result can be that high and other than a neural tube defect, the only other cause would be if I had liver cancer. That’s what I was hoping for. We eventually got the ultrasound but the night before I begged God for a miracle. I knew He could take all of this away. I knew he could make this all a lab error and show me a perfectly healthy son that I could hug and squeeze and nurse and could play with Weston. I told him I won’t be mad at Him if He says no, but I know He can do this and I would never be so grateful for anything in my life. I would be a better follower of Him, a better wife, a better mom, if He could just spare my son of this. I don’t usually make deals with God, but it seemed like a pivotal moment to try. 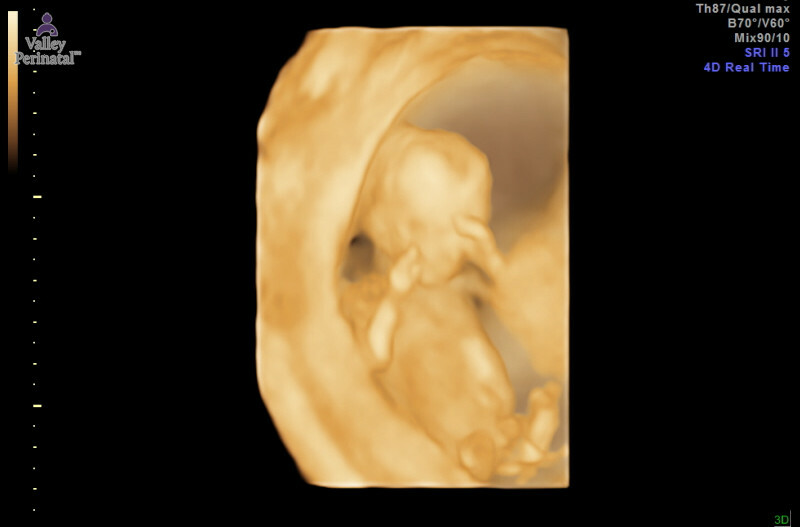 The ultrasound showed almost exactly the things we had seen in Miles. A severe Arnold Chiari II brain malformation, an elongated cerebellum, a lemon shaped head, an indented and open spinal defect and spaced out vertebrae. The flat open defect is very rare and part of why we believe Miles is such a severe case of SB. Caleb was exactly the same. They looked at him under ultrasound for 2 hours. Is his defect in the lumbar region of his spine? Maybe thoracic? Wow, the situation kept getting worse. They said they would fight hard for me to get inutero surgery this time. There are great risks to mother and baby during this surgery. We were prepared for the news but it still took our breath away and sent hot needles down my body. I couldn’t help but ask the doctor if she had ever known a mother with two SB children before. No she hadn’t. The usual thoughts quickly ran through my head. What did I do wrong? What is wrong with my body? I will never be able to have more children. Did I do something to disappoint God? How will I ever watch another child go through what Miles has? How will we afford this? Are we equipped to care for two disabled kids? I didn’t realize a broken hearted person can still have their heart broken again. He smiled, “We will have a wheelchair softball team!” I finally laughed. We spent the rest of the day letting it soak in. The pain is real and the grief is thick. All of the emotions and fears are the same as when we found out about Miles, yet not as intense. I cry periodically, but not as often. My appetite is suppressed, but not gone. My heart falls out of my chest, but then returns to its home. I hope for miracles, but I’m not begging for them. We have gotten used to bad news. And the concerns are different this time. Somehow it makes last time look simple. Miles is unstable and on hospice. He needs 24/7 critical, acute, 1 on 1 medical care. The state does not provide us 24/7 care. Who will care for Miles while Caleb is in the hospital? How does Bryce hold down a job in this circumstance? His beard has already gone grey in less than a year. What will we do about our bad insurance? Weston is older now and needs us. Who will care for him while we are gone? How will we fit the boys and equipment in our car? How will we fit in our home? I am already not in great health. Am I capable of taking care of these kids? Those questions are real and something only The Lord can provide answers for. My mind starts to explode when I think of them all at once. For some reason, God has asked a lot of us. I often wonder why he chose us. Why he thought we were adept in living this life. I also know there is a lot more to life than my comfort and when God calls you to something, you answer. You do it with thanksgiving and praise. I’m lucky God entrusted me with His most precious spirits. I hope I can make Him proud.